Hello Lovelies! Today I'm back with yet another elf post, please do let me know if you're all getting bored and I will try my best to vary up my posts a bit more, but now I'm stopping myself from spending as much, it's harder to always have new products to review! Another one of the prizes I won from elf were a collection of their mineral eye shadows, which are a perfect dupe for the Bare Minerals ones which I already own for about a quarter of the price! The shades I received were (L-R): Royal, Earthy, Sweet, Innocent, Partier, Enchanting, Bronzed, Flirty, Beachy, and Elegant. 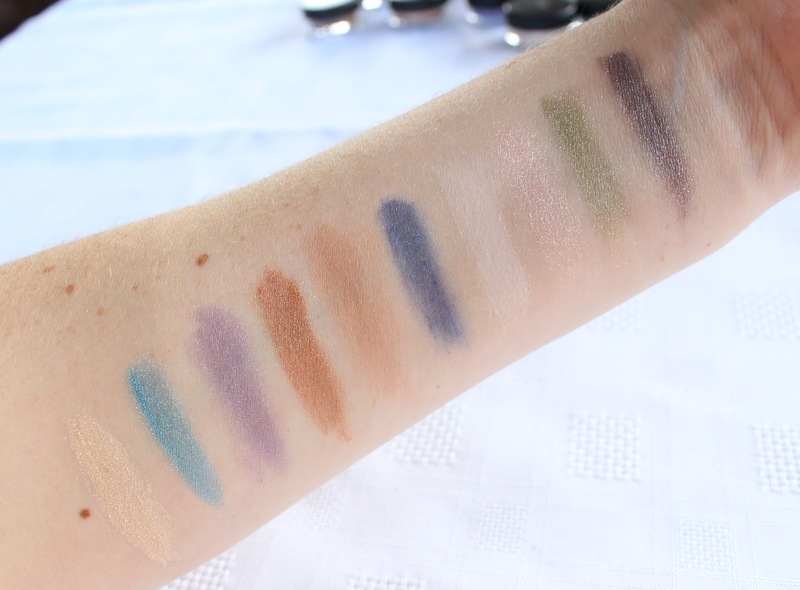 These eyeshadows are all very pigmented, although some of the lighter shades aren't showing up. My favourite colours are Royal which is a shimmery greyish purple colour and looks amazing as a crease colour, Earthy which is a dupe for MAC Sumptuous Olive and Sweet which is a dupe for Bare Minerals 'Serene'. These are loose eye shadows though so go careful when opening and applying because you don't want to make a mess, however the lose formula of these do make them incredibly easy to apply and blend out for a more natural look. Overall, I love these eye shadows and for £3 you can't really go wrong, especially when the Bare Minerals version cost £14! I LOVE the purple colour at the end, I think it is Royal, the one you are talking about, so so pretty! I bet I would make a right mess of these though, I'm terrible with loose powders! You have so many great colours here! They look wonderful. These look promising, the olive green is beautiful! Oh such prett shades and for that price you can't go wrong!